According to the latest survey from the International Standard Organization, ISO 50001 certifications increased by 69% in 2016 compared to 2015. It is continuing to see significant growth in Europe with Germany taking significant proportion of these certificates. The USA is surprisingly low number of certifications to date. 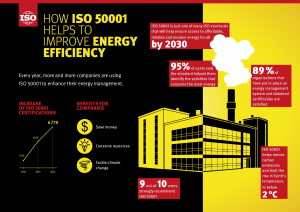 This infographic published by ISO shows the benefits of ISO 50001 to industry.